‘When our perils are past, shall our gratitude sleep? So wrote George Canning about William Pitt in 1802. The Treaty of Amiens had just been signed with the French, one of its clauses handed the colony of Ceylon to Britain. Anyone who walks down to take a look at the future Millennium exhibition site on Greenwich Marsh may well find themselves looking for a pub. There is only one, The Pilot, in River Way, which is a fine, recently modernised, hostelry. Those who look closely will see a plaque on the wall of The Pilot which reads ‘New East Greenwich, 1804’. This seems to imply that The Pilot and Ceylon Place, the row of adjacent cottages, were some sort of new development away from the main industrial town of Greenwich. If a developer came to Greenwich Marsh two hundred years ago, who was he? And why did he think this piece of unpropitious marshland was somewhere suitable to build? 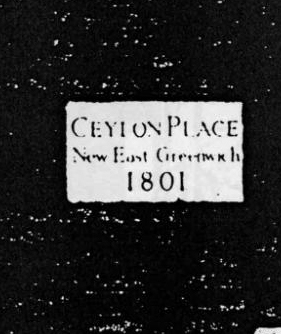 Entries in the Greenwich rate books show that Ceylon Place and The Pilot were indeed built in 1804 and, in addition, that the site’s owner was George Russell. Russell continued to be listed in both rate books and directories as the owner of New East Greenwich for many years after. In 1830 a directory lists him there under ‘nobility and gentry’, but where did he live? The unpretentious cottages in Ceylon Place are hardly residences for a gentleman! In 1832 he is listed there as a ‘miller and mealman’ – but this is to run on. Who was George Russell? In 1792 a Mr Russell, who lived in Greenwich, was burgled. He must have lived close to the river because the criminals escaped in a boat. Is this George Russell, and did he live at or near ‘New East Greenwich’? There is no record of a house there so early. Later in the century there was a big house on the river front, up past The Pilot, at the end of the cottages. Its site was where Greenwich Yacht Club now have their premises and it was called East Lodge. From pictures it looks to be early Victorian, rather later than the 1790s. All that is known about its origins comes from an account, written in 1932 by Anne Askew Davies, who lived there as a child, and little of what she says makes dating it any easier. She said the house was built by a Mr Hughes as ‘a pleasure house for his parties’ and a ‘Jamet Hewes’ is first men- tioned in records in the 1830s. Anne also said that a canvas ceiling in the house was painted by Sir James Thornhill – but he died in 1734! Then she said something else, very strange indeed – ‘under the house were brick arched cellars, perfectly dry, like those under the College’. These dry cellars were on the river-front of sodden Greenwich Marsh! Is it possible that East Lodge was built, in the 1830s, on the site of something far older? The other description of George Russell as a ‘miller’ is to reveal a lot of the story of New East Greenwich. Along with The Pilot and the cottages was built a very large and important tide mill – across the road from The Pilot, on the riverside site where Blackwall Point power station stood until a few years ago. A tide mill is technically a water mill but on a very large scale. This one was built to harness the power of the River Thames and its tides. Only a few miles to the north of East Greenwich is Three Mills, at Bromley- by-Bow, where the House Mill is now open to visitors on some Sundays. To visit Three Mills is to understand that a mill like this is a big operation on an industrial scale with nothing rural or ‘olde worlde’ about it. The House Mill means business and East Greenwich, although not nearly so large, was built to maximise the power of the river to shift a lot of grain. One account of the mill says that it was built to grind flour for the London Flour Company which had been set up to provide cheap bread for the metropolis. We know a lot about the East Greenwich mill because one afternoon, in 1802, Olinthus Gregory, Professor of Mathematics at the Royal Military Academy in Woolwich, went for a riverside walk. When he got to where the mill was being built he was very interested, and stopped to chat to the foreman. The foreman, in the way that foremen do, told him in a lot of detail how he would have built it differently, himself, given his way. Gregory did some drawings and later wrote a technical description of the mill. The mill stood parallel to the Thames with a channel under it which allowed water to come in and out from the river. Behind the mill was a four-acre reservoir which filled with water on the incoming tide. In the channel was the mill wheel, which worked as the tide came in, and was then reversed as the water was let out of the mill pond on the ebb. Thus the mill could be worked all the time. It was built by a millwright called John Lloyd. There was nothing rural or ‘olde worlde’ about Lloyd either. Among other things he was currently building the Government armaments complex at Waltham Abbey. 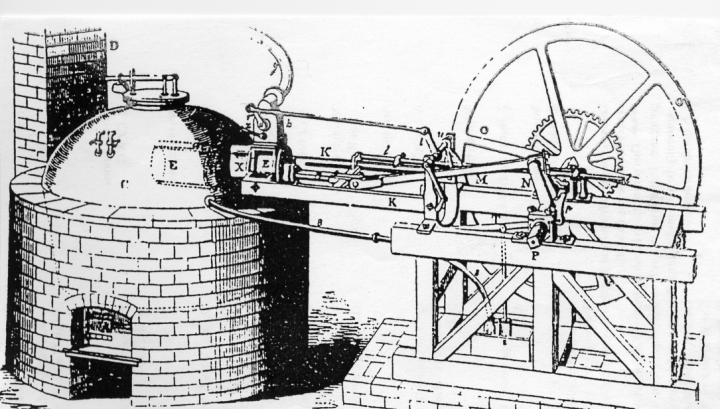 We read a great deal about the steam engine builders of this period because what they were doing is seen as ‘revolutionary’ and exciting, but at the same time millwrights, like John Lloyd, were at their peak. They were undertaking some very important installations – but, because they are seen as ‘old tech’ we never hear of them. John Lloyd was building the Waltham Abbey Works, as a matter of Government policy, with no steam, but he knew about steam engines and used them where they would be useful. At East Greenwich a steam engine was used to build the mill – but that is another story. New East Greenwich, then, consisted of a big mill, cottages for the workers, a pub, perhaps a big house. Who was George Russell? To find a clue we need to go to Sidcup, to Longlands, a big house, now gone. Records say that the owner’s son, a George Russell, lived at ‘Mill Place, Greenwich’. Well, we have at Greenwich a mill, if no ‘Mill Place’! George Russell’s father, the owner of Longlands, died in 1804, and his name too was George. He was a very rich man and had made his money out of soap. Nowa- days we do not associate soap works with London, but, in the last century, the largest soap factory in England was at Old Barge House, on the south bank of the Thames alongside Blackfriars Bridge. It was a famous factory and was painted by Turner. At that time it was owned by Benjamin Hawes whose son, Benjamin Jnr, became a government minister and married a Miss Brunei. Benjamin Hawes Snr had bought Old Bargehouse Soap Works as a going concern from its founder, George Russell, at some time at the beginning of the century. It may be significant that Hawes became a member of the Tallow Chandlers’ Company in 1804. George Russell Snr’s father had been a Clerkenwell ‘soft’ soap maker in a small way. The son discovered a way of making hard soap and built, himself with his own hands, a soap works on the site of Queen Elizabeth’s old bargehouse. It has been said that he became the leading soap maker in England and was able to set prices which all others had to follow. At his death, in 1804, he left £150,000. It cannot be a coincidence that his death is in the same year as his son seems to have finished the East Greenwich Tide Mill and the soap works was sold. George Russell Jnr had clearly decided to invest his father’s fortune in this massive mill while abandoning the family soap business. Did he succeed? Who knows. The Hawes’ were to make a fortune and gain massive influence through the soap business they bought from him. It is unlikely that, as a rich man, he worked the mill himself. He had a miller, by the 1830s, Mr Patrick. What did George Russell do with his fortune? Did the mill swallow it all up? Did he go and invest in something else? New East Greenwich never seems to have been the thriving community he probably hoped for. In the 1840s the mill was sold to Frank Hills, who made an even larger fortune out of the site. More houses were built, there was a mission hall, and then the gas works came. In the 1890s the mill was demolished and a power station built on the site, not Blackwall Point Power Station but its predecessor. The 1990s have seen great plans for housing on the Greenwich Peninsula. Ceylon Place and The Pilot will become the only old buildings in a great sea of newness. George Russell probably thought he was founding a new community here, and perhaps that will now come about, although we can be sure that the area will not be called ‘New East Greenwich’. This article is based on a wide range of archive and written sources in collections owned by the London Boroughs of Greenwich, Bexley and elsewhere. Particular attention is drawn to the chapter on the mill in Olinthus Gregory, Mechanics (London, 1806). Some material used in this article forms part of a longer history of the mill to be published in a forthcoming Journal of the Greater London Industrial Archaeology Society. Illustrations by kind permission of London Borough of Greenwich Local History Library unless otherwise credited.